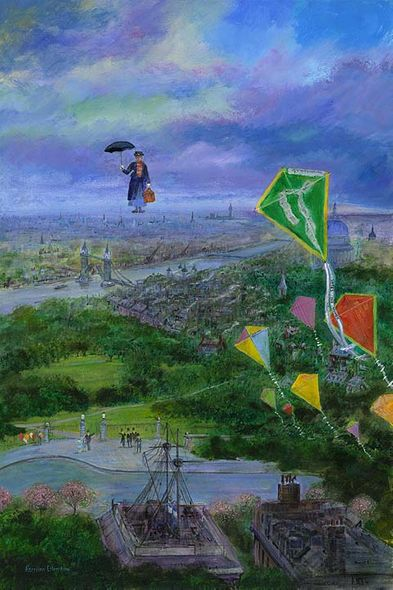 Harrison Ellenshaw Artist Signed and Numbered Limited Edition Hand-Textured Giclée on Canvas :"Lets Go Fly a Kite"
Edition Size: Artist Hand Signed and Numbered to 95 with COA. Then, Harrison got a phenomenal break. "Fate smiled on me, as it had for my father," he says humbly. "I got a chance to do some work on ‘Star Wars'". At this point, a tale of two Ellenshaws becomes the tale of two separate Ellenshaws, as this is where Harrison begins to really strike out on his own, away from his father's legacy. His work on "Star Wars" was so well received that he was asked to return to work on "The Empire Strikes Back". By this time, having clearly carved a niche for himself, Harrison had no problem working with his father on Disney's "The Black Hole" in 1979. Harrison then went solo again to add his unforgettable touch to "Tron", one of the most unique and visually stunning films ever, now a cult classic.